Alpine's advanced application of Class-D technology keeps the signal in the digital realm until just prior to output, and markedly improves detail in the high frequencies, thanks to enhanced time management (pulse) accuracy. Ovozmozuvaiki pojacuvanje od 40Hz za zgolemuvanje na impaktnost na zvukot od subwoofer. 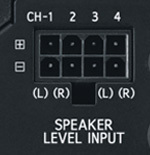 The product is equipped with high pass and/ or low pass filters which allow various configurations of your system.